Used by more than 1,400 institutions and completed by more than 2.6 million students nationwide, the College Student Inventory is the leading tool for early identification and early intervention with your newest students. How do first-year students feel about college as they begin their academic careers? 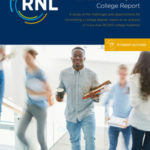 Learn the motivations, attitudes, and challenges for today’s incoming college students, based on data from 95,000 college freshmen. Choose from three forms of the College Student Inventory. Note that even if you choose paper administration of the CSI, you will receive your reports online. Offers the most comprehensive analysis with 19 motivational assessment scales. The most widely used version of the CSI, Form B analyzes student attitudes across 17 different scales. Designed specifically for students who seek to balance work, family, and academics, such as adult learners. This version of Form B reflects Canadian terminology and spelling. Spanish versions: Forms A, B, and C are available in online Spanish versions. For information on administering the College Student Inventory, see our implementation guidelines and frequently-asked questions.